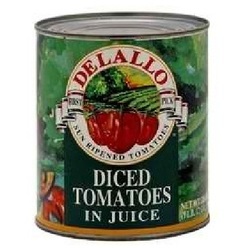 Crushed Tomatoes hold the ground between whole tomatoes and their diced counterparts. Ours come from California, land of fertile fields and sun-ripened flavor, with the sweet, thick body and traditional Italian spices that will make short work of your sauce or stew preparation. Use them whenever you're planning to puree your sauce, or in cases where a rustic texture is the goal.